When you learn a new skill, the beginning tends to be the most frustrating part. Often, you’re not sure what you should be doing exactly, or how you should be doing it. This applies to everything from when you start playing a new sport to when you try speaking a new foreign language. Fortunately, the process of becoming better at new skills is relatively predictable, and can be broken down into different stages of learning. Once you understand how this process works, you will understand why the beginning is so hard, and you will be able to identify your position in the learning process. This will make you more aware of your abilities and more conscious of your learning, and will help you learn new skills better and with more motivation. Unconscious incompetence- this is the beginner stage, which you start at when you first start practicing a new skill that you want to learn. This stage is characterized by the fact that you don’t know what you don’t know. As such, you’re not entirely aware of what the new skill entails, and you’re not exactly sure what your goals should be, meaning that you end up making a lot of mistakes, without realizing that you’re making them. Conscious incompetence- this is the intermediate stage, which you reach after developing some familiarity with the new skill that you’re learning. At this stage, there’s still a lot that you don’t know, but you can now recognize what you don’t know, and what you need to learn in order to improve. As such, you still make a lot of mistakes, but now you’re at least aware that you’re making them. Conscious competence- this is the proficient stage, which you reach after you develop a strong proficiency at the skill that you’re learning. At this stage, you already have a good grasp of the skill and of what it entails, so that you make only a small amount of mistakes while practicing. However, performing at a high level still requires a significant and conscious effort on your part, and a lot of things that the skill entails still aren’t intuitive to you. 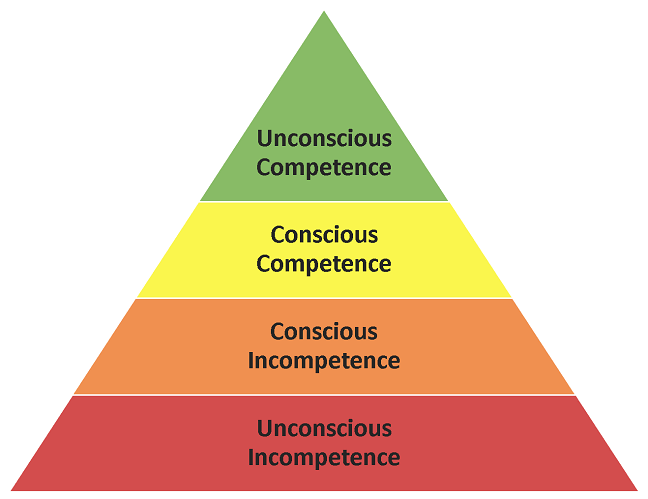 Unconscious competence- this is the mastery stage, which you reach once you develop a very high level of proficiency in the skill. At this stage, you make very few mistakes, and have an in-depth understanding of the skill and of what it entails. The biggest difference between this stage and the previous one is that performing at a high level is now much more intuitive, and no longer requires as much conscious effort on your part. These stages are often mentioned in various discussions of learning theory, as it relates to various topics, ranging from sports, to music, to language learning, and so on. Some researchers propose the existence of a fifth stage of learning, called unconscious supercompetence. This stage is similar to the fourth stage of learning (unconscious competence), but signifies a higher and more effortless level of competence, where the practitioner is aware of their ability to perform the skill easily and without conscious effort. In general, this stage of learning is less clearly defined than the other stages, and is less commonly referenced in the research literature on the topic. However, the possible distinction between this stage and the fourth one isn’t crucial for most people learning a skill, since this stage signifies the highest level of competence possible, and as such applies only to relatively few people, who are already strongly familiar with the skill that they are learning. This theory of learning is attributed to different people in the various sources that mention it. Some studies attribute it to Abraham Maslow, who developed the hierarchy of needs, while other studies attribute it to various other people, the most notable of which is William S. Howell, whose 1982 book is cited as a resource in a large number of research papers on the topic. One possibility for why the source of this theory is unclear, is that several people came up with similar conceptualizations of this model independently from one another, around the same time. Nevertheless, the question of who came up with this model first is not crucial for most people, as it doesn’t have any effect on how the theory is applied today. The main benefit of understanding the concept of the stages of learning is that it gives you a better understanding of how your learning process works when you’re acquiring a new skill. This is valuable, because it can help you identify the stage that you’re at, which will allow you to figure out what your biggest weaknesses are, and where you need to improve, without feeling discouraged. In the sections below, you will read about a few specific areas where you can implement your understanding of this learning theory, together with a few additional pieces of advice which will help you implement this knowledge as effectively as possible. As we saw earlier, the first stage of learning a new skill is the unconscious incompetence stage, where you essentially have no idea what you’re doing, or what you need to focus on. While this stage is inherently frustrating, it’s also a completely natural part of the learning process. It’s important to understand this, since a lot of people assume that the fact that they struggle at first means that they have no chance of successfully learning the new skill that they want to get better at. By realizing that this initial struggle is perfectly natural, you should be able to stay motivated, and keep working until you manage to successfully improve your abilities. Sometimes, when you practice a skill that you’re trying to improve, you might feel like you’re actually getting worse over time, instead of better. A common reason why this happens is that you’ve advanced from the first stage of learning, unconscious incompetence, to the second stage, conscious incompetence. This means that you might start feeling like you’re suddenly making a lot of mistakes. In reality, however, you were likely already making those same mistakes beforehand. The difference is that you’re now good enough to actually realize when you’re making those mistakes, whereas earlier you simply didn’t have the necessary proficiency which is required in order to be able to notice it. Note that there are other reasons why, as your proficiency improves, you might feel like you’re getting worse, such as the fact that the more you know, the more factors you have to consider. For example, if you are playing a sport where at first you only have to think about your offensive abilities, then advancing to a stage where you also have to start taking defense into account is likely going to reduce your overall performance in the short term, since you’re now paying attention to a lot more things at the same time. While this might make you feel like you’re getting worse, since your performance on specific tasks is going to be worse in the short term, in reality this change in performance signifies your growing competence, and your newfound ability to understand the skill on a deeper level. When you’re developing a skill, it’s perfectly natural for the different subskills that it contains to be at different stages, in terms of competence. For example, if you’re learning a new language, it’s possible that your reading will be at a higher level than your writing, or that you’ll be better at understanding what people are saying compared to saying those things yourself. This variability is something that you should normally expect to see it in your learning process. If you notice that this happening, don’t let it frustrate you, and simply keep working on your weaker subskills until you get them up to the level that you want them to be at. Understanding the stages of learning can also help you give more effective feedback to other people when you’re trying to help them learn a new skill, because it allows you to tailor your feedback to their proficiency level. Specifically, people at different levels of competence are going to benefit more from different types of feedback. For example, during the earlier stages of acquisition people are generally less capable of handling large amounts of feedback, or feedback that is too complex, because they simply don’t have the necessary abilities in order to deal with such feedback. Conversely, at the higher levels of competence, people are often going to want to get specific technical details, that will help them build upon the basic skills that they have already acquired. Overall, there isn’t a single method for giving feedback that will apply to everyone. Rather, the important thing is to assess people’s proficiency level, and to take it into account when giving them feedback, so that they can receive the feedback that will benefit them the most. The psychological model of learning that you saw here is meant to give you a rough idea of the stages that people go through as they learn a skill. You can benefit from understanding this model in various ways, such as by being able to figure out where you are in the learning process and what you can do to improve. The most important thing to remember from this model is that feeling like you have no idea what you’re doing in the beginning is perfectly fine. When you eventually start realizing that you’re making tons of mistakes, that’s not a bad thing either. Instead, these are both predictable and necessary stages of learning, that you go through as you slowly improve your abilities. When you work on improving in a certain skill you go through several stages of learning, each of which signifies a different level of competence. The first stage is unconscious incompetence, where you don’t know much, and you’re also not sure what you don’t know. The stage after that is conscious incompetence, where you still struggle, but where you can start identifying what you need to do in order to improve. Next is the stage of conscious competence, where you’re fairly proficient in the skill, though performing at a high level requires a significant amount of effort. The final stage is unconscious competence, where you’ve mastered the skill, and can perform at a very high level while relying mostly on your intuition. The main thing to understand, based on these stages, is that it’s perfectly natural to feel clueless when you first start learning a skill. This simply means that you’re at the unconscious incompetence stage, which you can advance from if you’re willing to put in the necessary work. In addition, it’s important to understand that it’s natural to sometimes feel like you’re getting worse instead of better. This is often the result of your improvement, and most commonly of the jump from the unconscious incompetence stage to the conscious incompetence stage, which means that you now have the necessary proficiency in order to identify the mistakes that you have always been making. Keep in mind that different subskills might be at different levels of competence, so that if, for example, you’re learning a new language, you might find that your speaking is at a higher level than your writing. This is natural, and you can work to close this gap as you improve your overall proficiency in the skill.